11 1/2" x 8", handles 15"
Doubled yarn worked in garter stitch create the corduroy look of this bag. The flap curls back on itself and is designed to hide the exposed hardware of magnetic and friction clasps. 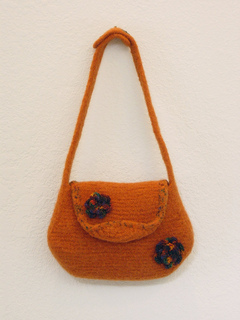 After felting the bag is embellished with easy to crochet flowers made of sock yarn. The handles are finished with decorative buttons. Materials: Sz 11 US 24” circular and double points, smaller 24” circular for picking up stitches.